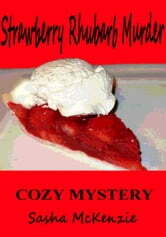 STRAWBERRY RHUBARB MURDER is BOOK 2 in the Spring Grove Mystery Series. Sweet, Polly Ann's Pie Shop opened a couple of months ago in a small quaint town of Spring Grove, PA. Polly's Pie Shop is great place for the locals to gather from the young to the old--where they can gossip, do homework, show off quilt patterns--you name it, while enjoying a sugary treat. Who can resist a slice of strawberry rhubarb pie on a lovely Spring Day in March? Find out what happens when someone is found murdered. Polly gets more than she bargains for--As Polly is growing her business, she again has to put her sleuthing skills to practice to solve the mystery. STRAWBERRY RHUBARB MURDER is full of mystery, sugary treats, romance, and humor. This book is a great read for an afternoon read and this cozy mystery is family friendly! Start by reading LEMON MERINGUE MURDER, Book 1, in the Spring Grove Mystery Series. Cute book,would like it a bit longer but it was interesting..good sounding pies and always find the murderer..